Sibling fighting, while inevitable, can turn your household into what feels like a war zone. Your children bickering, teasing, poking, and all around annoying each other can seem like an endless stress cycle. 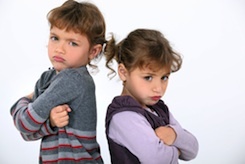 There are, however, some ways that you can lessen sibling fighting and create a more peaceful, cooperative environment. Set strong, clear boundaries for acceptable behavior and stick to them. 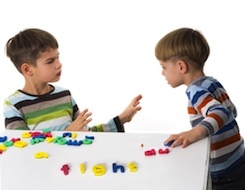 Sibling fighting is one of those challenging behaviors that can quickly wear you down, so it’s hard to stick to your guns about what behavior is okay and what is not. But when it comes to getting to better behavior, consistency is the key. A family meeting is the perfect opportunity to get everyone together and set the ground rules for how family members should treat each other. Everyone, both children and adults, should have a say in the rules. When your children are part of creating the rules they’re much more likely to follow them. Talk about what respectful language looks like, what type of touching is welcomed (e.g. hugging, tickling) and what type is not allowed (e.g. hitting, poking), and how they’re going to solve disputes. When the rules have been agreed on by everyone, outline what will happen if those rules aren’t followed. Then write them down and include visual cues to help kids remember. Teach your children problem solving skills. Giving your kids the tools they need to solve their own problems will really pay off in the home environment. Children fight most often when they don’t feel they have better options. They get angry, frustrated, impatient, or hurt and they lash out. When you give your children the tools to talk about how they feel, to think about how others think and feel about a situation, and to come up with solutions that work for everyone involved, you’re giving them the power to stop fighting and start cooperating. Help your children understand the different perspectives of their siblings. Children think everyone sees things the same way they do. They need help understanding that others often see and feel things very differently. What’s funny to one child may feel like hurtful bullying to his brother. What’s no big deal to one child may be a huge deal to his sister. What seems like a logical solution to one child may seem completely unfair to her sister. Help children express how they feel to their siblings in respectful language (e.g. “It hurts my feelings when you say I’m a klutz”, “I don’t want to share my new game with you because it’s my favorite toy and I’m afraid you’ll break it”). Help children process what’s been shared with them and encourage them to try and see things from the other perspective (e.g. “Can you think of a time when someone called you a name and, instead of it being funny, it hurt your feelings?”, “Can you imagine how hard it would be for you to share your favorite game if you were afraid it would get broken and you wouldn’t be able to play with it anymore?”). Seeing things through another person’s eyes builds empathy and increases sensitivity to what others feel and need. That’s a great way to help siblings stop fighting and start supporting each other. Don’t take sides. Finding ways to solve the problem, not assigning blame, is the best way to move past an issue. When you try and figure out who did what and who did it first you get stuck in the past. When you start from where you are and work on ways to move forward, you take charge of the future. You rarely have all of the information to know who’s really at fault anyway. 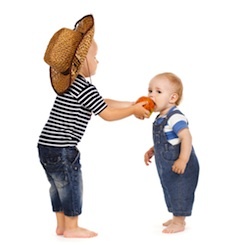 You may see your middle child push your older child as they walk into the room but it may be in response to something the older child did in the other room. Only they know the full story and they each see it through their own eyes. Focus on what you want them to do instead of what you don’t want them to do. It’s easy to talk about what you don’t want: don’t hit, don’t push, don’t hog the TV, don’t grab his toys, don’t tease. It’s harder, but so much more productive, to talk about what you do want: use your words instead of your hands, decide together on a TV program, ask when you want a turn with a toy, talk respectfully. Not only does positive language change the overall tone of a situation, it teaches children to focus on what they’re doing right instead of what they’re doing wrong. Kids who feel good about themselves are much more likely to follow rules and treat others kindly and fairly. Sibling fighting is typical and can’t be avoided completely. However you can get to a place where your children get along more often than they fight, and where they truly enjoy being around each other.